Alfredo and Isabel Aquilizan are a husband-and-wife team who emigrated from the Philippines to Australia in 2006. 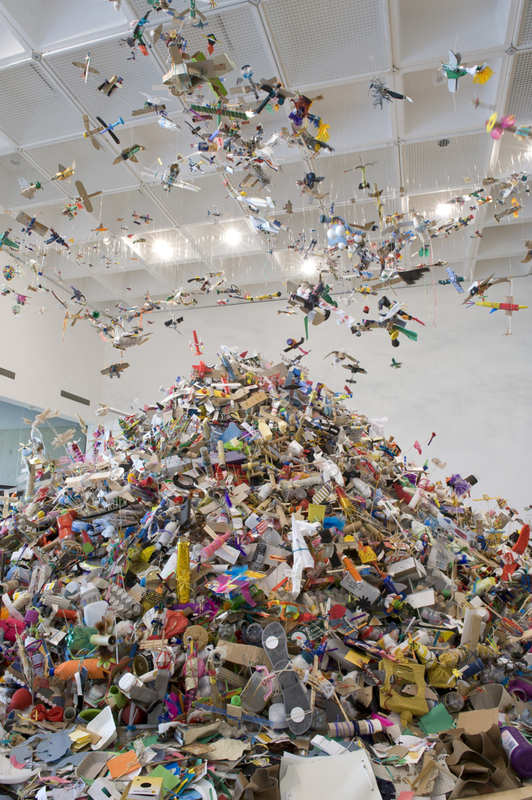 Their artworks often address themes of displacement, change, memory and community. Together they have exhibited at a number of international exhibitions including the 50th International Art Exhibition of la Biennale di Venezia, 2003; the 5th Gwangju Biennale, 2004; the 15th Biennale of Sydney, 2006; the Singapore Biennale 2008; the Liverpool Biennial, 2010; and the Sharjah Biennial 11, 2013. 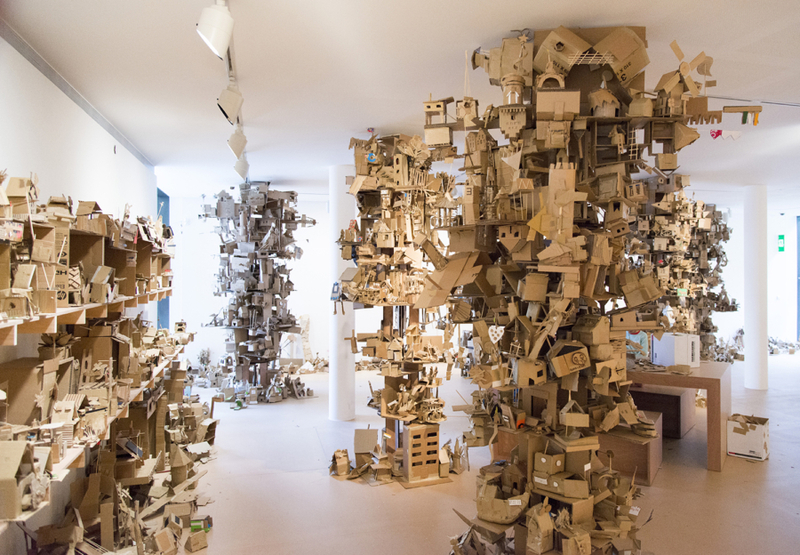 Their latest participatory work in Auckland invites gallery visitors to collaborate using recycled cardboard boxes to create a model city, and reflects the artists own migratory experiences. From Pillars to Posts: Project Another Country is on view now at Auckland Art Gallery until Sunday 16 September, 2018. Aisha Johan spoke to the pair from their studio in Brisbane. Aisha Johan: I moved around as a child, from Jakarta to Sapporo, to Bali, and then to Auckland where have lived for the past 10 years. One of your works from the 2006 Biennale of Sydney, Zones of Contact, spoke to me on so many levels. 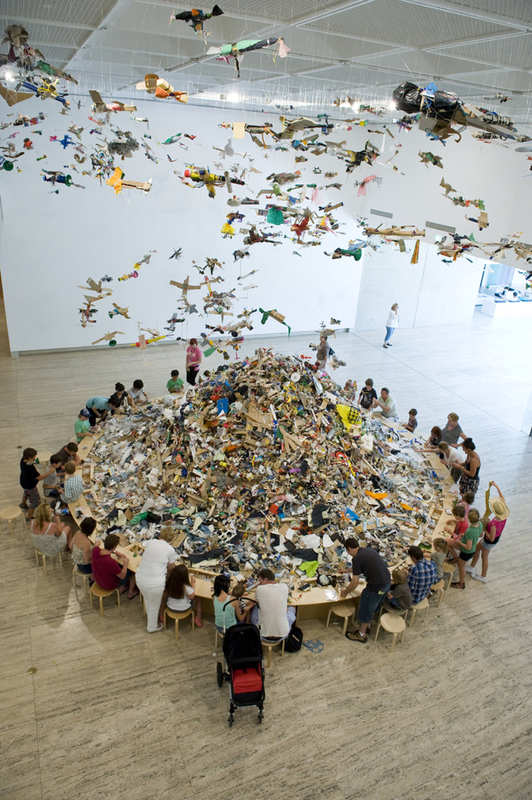 Titled Project Belonging: In-Transit, 2006, the work consists of objects that belonged to you and your children, which have been boxed up and displayed to represent the objects you could take when your family migrated from the Philippines to Australia. There’s a sense of limitation there, of fitting your whole life in a suitcase. Could you please tell me more about this particular project? Alfredo and Isabel Aquilizan: When you move, it is always a wrenching process not only on the idea that you are actually leaving home but also the process of choosing what to leave behind and what to bring along with you. What do you really need to start a new life? There is always that feeling of uncertainty, vagueness and tentativeness that diverting it to an art form, it becomes a process of healing. As a result of this decision we developed a project that was presented in three parts and in three simultaneous exhibitions. These included Belonging: In-Transit at the Biennale of Sydney, Belonging: Terminal at the Cultural Center of the Philippines, and Belonging: Last Thing at the National Museum of the Filipino People. We exhibited things that we had left behind in the Manila exhibition, what we had brought along in the Australian exhibition, and our deconstructed ‘studio’ and all its contents bestowed to the Museum of the Filipino People. When everything is packed in a transport palette and boxes, a project about the negotiations of site almost had to be successful in its references. As the materials themselves signify the anticipation of a beginning and a revision of an origin, between art and life. 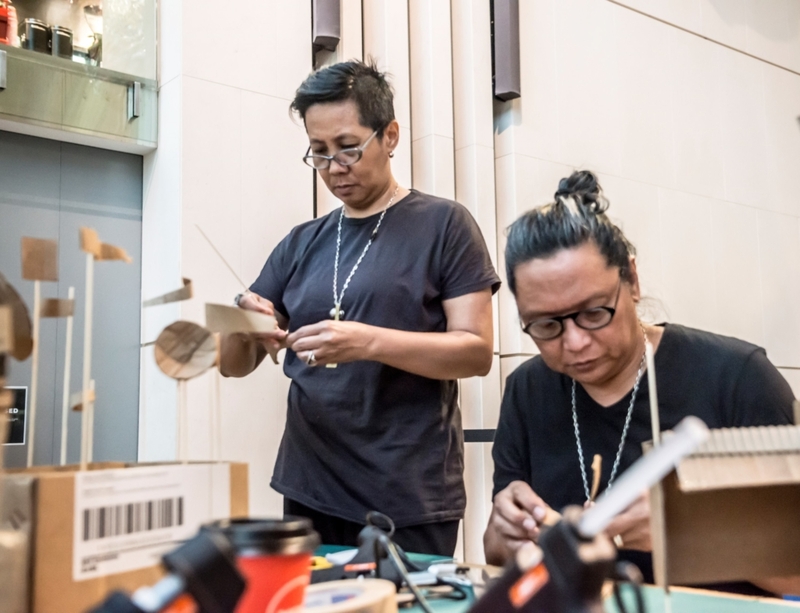 The Balikabayan box is an ingenious invention of the Filipino Diaspora to stay in touch with their families, relatives, friends and ‘motherland’. The Balikabayan box, or the home-returnee’s box, is a bric-à-brac kind of collection of everyday consumer goods including clothes, kitchenware and canned food to be brought or sent back to the Philippines by emigrants from outside. It’s usually small enough to be carried on airplanes or sent by the post. Therefore, its actual material value is much less important than its symbolic one: with a limited amount of everyday objects, it’s in fact a powerful and rich reminder of the emotional and spiritual linkage between those on exile and their homes, between the floating individual and the rooted community. More interestingly, this small box always embodies the most profound contradiction and sentimental dilemma for many who are surviving at the margin of globalisation, whose home-longing actually signifies an unrealisable dream: longing is actually what they belong to, the real form of their being. 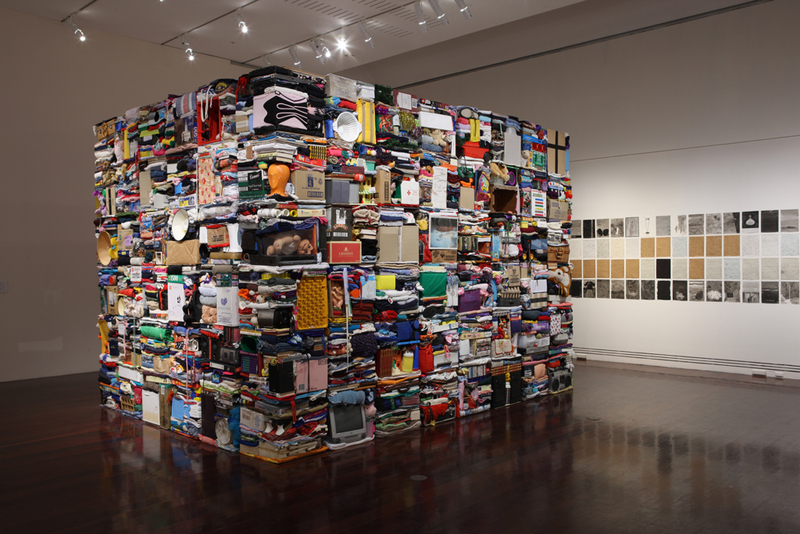 AJ: Now that you are based in Australia, but travel for biennales, residencies and other exhibitions around the globe, has your view of “fitting life in a suitcase” changed? A&IA: As we always say, when you leave home you don’t have any place you call home anymore, you become a foreigner and being one, we always use this as a take-off point for all our projects. In this case, Project Another Country is that space in between. A lot of our projects have always confronted the complexities of domestication by actually living them out in the different spaces provided by art. These projects reach into the relationship of nature and culture and habitat and requires working with intuition and with extra sensitivity to what our locations may ‘tell’ us. This means using the materials on hand—scraps, leftovers, things that are actually being used everyday, whether as necessities or luxuries which, for the sake of survival or memory, are ultimately indispensable. These materials range from what we use in our own domestic life to the life of the communities we work with. Being a family and living within a community, it became useful and even essential for us to work with others. Project Another Country is a new project that is a quasi-documentation of our migration and our investigation of how art transforms the sensibilities of individuals who have had an actual participation with the artwork whether directly and a collaborator in the production of the artwork or as an audience member being active participants in the production of the meaning of the work. AJ: Most of your works are dialogues with your audience. What kind of conversations are you trying to have with them? What sort of discussions do you have with each other as part of your creative process? A&IA: Most dialogues evolve around the idea of human conditions that are associated with home and family, movement and diaspora, memory and nostalgia, language and the difficulty to adapt. Through different materials and structures we were able translate these into a visual language that becomes a tool to view all of these [ideas] in another form and in the process creates a deeper understanding of contemporary issues that evolve around contemporary culture. It is also a conversation about art and how the process of art-making becomes a space of engagements and it is also a conversation about aesthetics, about the basic elements that becomes a tool to create meanings. AJ: Various types of transportation have appeared as a theme in your projects. Aeroplanes in your work for the APT6 in QAGOMA and boats in Passage III at the Singapore Art Museum 2016 exhibition, for example. Both symbolise the long journey of migration and the experience of moving to a new place to start afresh. However, you have also incorporated cars in the Transformer series, taking inspiration from the jeepney that is so deeply rooted in the culture of the Philippines and its history of colonisation. How do you examine the connections between migration and cultural history in creating a body work? A&IA: Cultural history is always a part of what we are today as Filipinos, migration and diaspora are just two of many aspects that reflect the very complex history that the Philippines has. Everything is interconnected and it needs an in-depth reading and reflection of our history for us to be able to comprehend the issues of our time. In some cases, we have used images or actual vehicles and transport vessels as signifiers to create new meaning and through engagements (site, space, context, audience) multiplies the meaning of the work. AJ: In the past, you have stated that your work ‘represents sentiments shared by many in disenfranchised and marginalised communities of the world’. Is this why you like to use easily accessible everyday objects, such as cardboard, rubber sandals, sickles etc.? A&IA: The use of ordinary and everyday objects is a strategy for us to connect with our audience and for them to become active participants in the creation of the meaning of the work. When you get people become part of the actual ‘making’ of the work in the process you demystify what art is. We also use this materials for its aesthetic value and how these materials relates to the idea of the work. AJ: Nowadays, the human movement around the globe has become an expected experience—Auckland itself as an example, has become a melting pot of cultures and people from the wider Asia Pacific region. Migration often leads to feelings of self-expression within their new adopted country, as people look to bridge the gap between what is considered their ‘home’ and where they currently reside. As can be seen in the diverse variations of cardboard houses created by Auckland Art Gallery visitors. How do you use this sense of individuality as a tool to communicate social issues in your work? A&IA: Most of our projects centre on individuals and their personal stories histories and belonging, as it deploys strategies of building, accumulating, and rearranging physical objects. We create situations for people to come together and engage, interact, share personal narratives, bringing together these narratives through the objects on view and by creating an installation that prompts conversation and stimulate further examination, the work becomes a tool that initiate people to respond and contemplate on their own personal issues in relation to a wider social context engagement that is according to their personal background, experience and narratives. Communities and the audience are invited to engage proactively in the production of the artwork and in the process create communal experiences. The pivotal point that was being stressed in these projects is the inter-human relations that go into the artistic production of the works. By setting up situations that create responses and that fuel a collective interaction, these projects go beyond their material form. Our customary practice is to immerse ourselves in the community, employing narratives from the objects and fragments of facts we continuously collect, reconfiguring mundane objects and treating personal gesture as a metaphor of human existence with particular emphasis on contemporary culture. Our approach is more organic and participatory than instrumental or institutional, and can be seen to contribute to a tradition of art that is socially and ethically concerned, and concerned about the views, ideas and narratives of other people. Our reason for involving communities and audience members to participate in artistic projects is, ‘create communal experiences’ and thereby ‘formulate meaning’. Our interest lies in the works providing a platform for exchange through creative processes, negotiations with the audience, audience members as active participants in the production of the meaning of the work, and the repercussions of the work with respect to the audience. AJ: When you were last in New Zealand, during the Govett-Brewster residency programme in 2010, you worked collaboratively with local communities in Taranaki. Cardboard boats made by the visitors were amassed into the installation titled Passage as part of the group exhibition, Stealing the Senses. 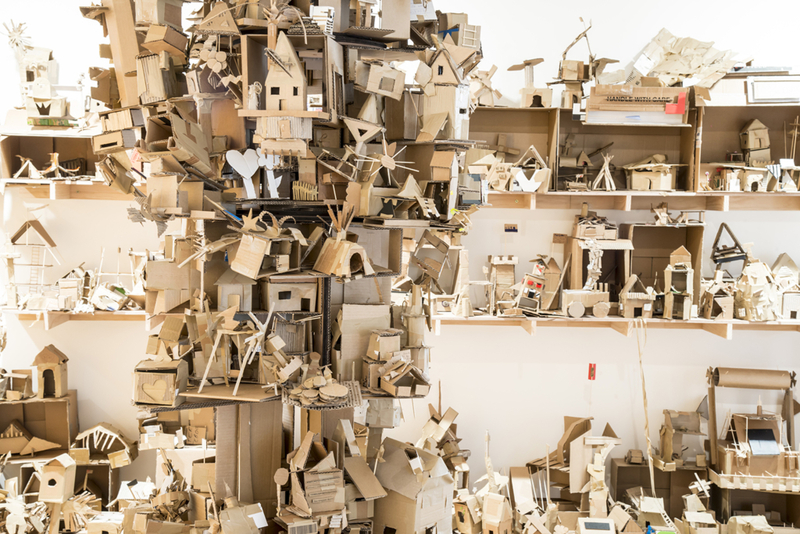 For your latest participatory work From Pillars to Post: Another Country Project at the Auckland Art Gallery, people are encouraged to build their own small cardboard houses, which will be assembled to make up a large installation. What sort of dialogues were you hoping to have with the people of Auckland this time? A&IA: The project in Auckland is all about the idea of home and its relation to global issues such as migration, dislocation, identity and homelessness among others as well as other circumstances resulting from these. We see Auckland as a melting pot, a place where there is an aggregation of people from different cultures, a local site that perhaps provide a space for a reciprocal dialogue on global issues that we have mentioned above. It can be an impression of local issues that impact universal intimations and possibly facilitate better understanding of matters that concerns us in our time. As the site and the process become an intrinsic element of the works being created, it is a continuous investigation of the notion of ‘place’ through the use of objects, the narrative of the site, and the participation of the locals. Thus the process of exchange becomes valued as the primary foundation of the artwork.